As I wrote in my Cabinet of Curiosities post a few days ago, I have been reading all I can find about the subject of the world's most famous painting, known as Mona Lisa, or La Gioconda. Who was the sitter? A real woman or an idealised composite of all that Leonardo da Vinci found admirable in a woman? 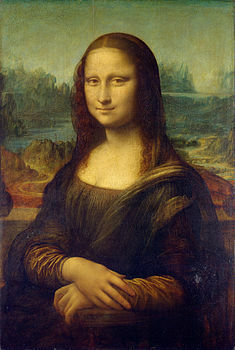 The most common identification of her is as Lisa Gherardini, the Florentine wife of a silk merchant named Francesco del Giocondo, hence La Gioconda. Francesco got his surname from a great grandfather who was always jolly - or "jocund." The idea caught on because of Lisa's husband's surname and the implied reference to her smile. 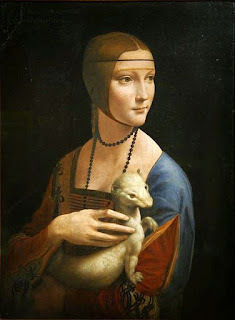 But she is not the only candidate - other who have been put forward include Isabella d'Este, who was desperate for Leonardo to paint her portrait, Pacifica Brandino, who was the mistress of Lorenzo the Magnificent's youngest son Giuliano, Isabella Gualanda, who is the cousin of Ceclia Gallerani, better known as the Lady with an ermine in another portrait by Leonardo. It was the rather unreliable Giorgo Vasari who gave the identification of the subject as Lisa del Giocondo in 1550. Lisa had died only eight years earlier and three of her children were certainly still alive then and living in Florence so he could have checked but perhaps that was not Vasari's way. He certainly didn't change his description of the portrait when he revised the book we now know as Lives of the Artists. But then he had never seen the painting and praised the depiction of the eyebrows, which we know are not present. I thought this was the beginning and end of what we knew about Lisa Gherardini until I saw a television programme about the painting on BBC2 last December. It was mainly about a new high-tech way of scanning the painting, used by Pascal Cotte, with the permission of the Louvre, which institution - interestingly - did not put up a spokesperson to comment on his findings. But what really caught my attention was Andrew Graham-Dixon interviewing an Italian specialist in a Florence in an area clearly recognisable as being in the Santa Croce district, where I have often stayed. This turned out to be Giuseppe Pallanti and I found he had also written a book, called in English Mona Lisa Revealed (Skira 2006). Pallanti is the kind of meticulous researcher who spends his life looking at historic documents of the driest kind: deeds of sale of properties, the equivalent of tax returns, records of baptisms - that sort of thing. And from that he has found out plenty about Lisa Gherardini, where she was born, the houses she lived in, her marriage, her husband's life, her children and her probable burial place. He continued his searches after publishing the book and they were passed on to an American journalist called Dianne Hales, whose own book, Mona Lisa: A Life Discovered (Simon & Schuster 2014) has publicised his further findings and added some of her own. Leonardo of course looked exactly like this when he was painting his most famous portrait. If we follow Vasari, the picture was started in 1503. It certainly is the case that the young Raphael, in Florence the following year, sketched a female model in a remarkably similar pose. And in 2005, half a millennium after Leonardo was at work on the painting, a marginal note was found, dated October 1503, in a volume of Cicero, stating that Leonardo was at work on a painting of Lisa del Giocondo. And, whether the painting was commissioned by Francesco del Giocondo or Giuliano de' Medici or someone else, they never possessed it. Leonardo took it with him when he left Italy for France in 1516, never to return.
' It was glorious. He had captured a quality in the sitter that would have been easy to overlook. Truthfully, she wasn't as lovely as Gandini the baker's wife, but she ha a restful presence - I can't explain it any other way - that had nothing to do with any of her features, nor yet her figure. And now here I am writing about her again for a novel for Barrington Stoke, a short fiction for teenagers called simply, Smile. 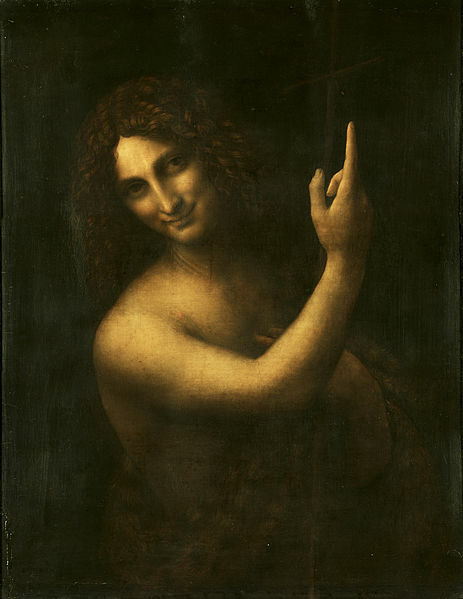 This portrait of John the Baptist is thought to be modelled on Leonardo's apprentice and probably lover, Gian Giacomo Caprotti, known as "Salai" or "little devil." There is a marked resemblance between his features and those of Mona Lisa. Was this true in real life? I like to think so. For all that they lived together for some thirty years, Salai was everything that Lisa Gherardini was not - gluttonous, amoral, promiscuous and not above stealing from his master and friend. Is it too fanciful to think that Leonardo saw in his Mona Lisa the model of a loyal and loving wife, who unaccountably looked like the venal young man he was so drawn to? That he saw in her an alternative life he might have lived, had he been a different man? One of the many things we will never know and why writers are continually drawn back to the story of the painter, the mdel and the 500-year-old smile. Fascinating theory and yes, looking at the two smiles, I agree with you.